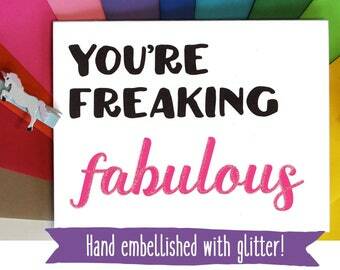 Free shipping to United States with $20 purchase from FourLetterWordCards. See item details below for sale terms. Who doesn't love colorful crap to write with? Use these magical pencils for yourself or get them as a gift for someone else. Either way, you'll be making someone's day with these festive little fuckers. ♥ Painted Round Graphite No2 Pencils - because color is awesome! 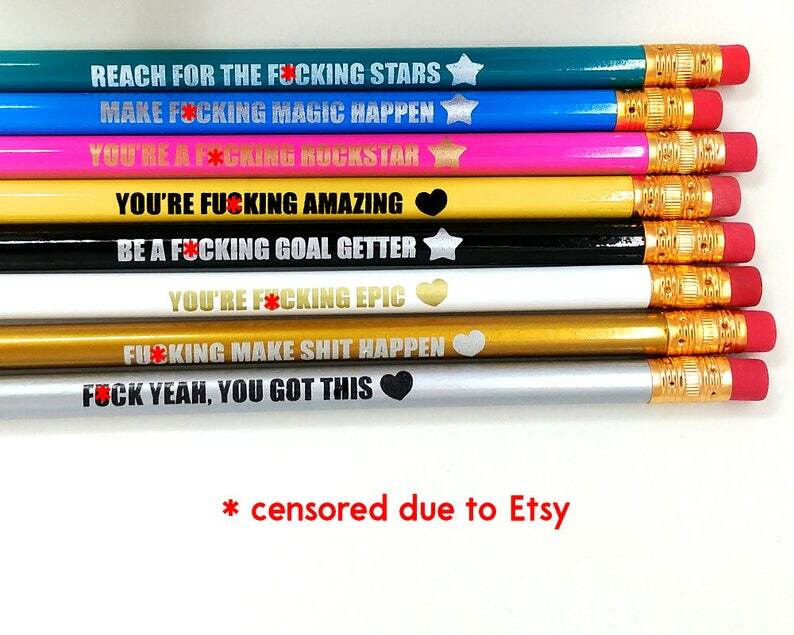 ♥ Our Un-sharpened Pencils come 8 to a pack - each color printed with a different badass quote. ♥ We do not offer customization on our pencils. They are sold as is. Thank you! ✉ Turn around times vary for each item. You can check the turn around time for the items you're interested in, by clicking on the Shipping & Policies tab. We try to ship out everything as quickly as possible, however it can take the full amount of time listed. If you need something by a specific date, please email us with the request. We'll do everything in our power to make it happen! ✉ All orders are sent via First Class with USPS- which generally takes around 5 business days for orders shipped within the USA, but may take longer, depending on the post office, weather etc. As much as we’d love to, we have no control over the Post Office. If there are any problems though, we’ll always do our best to fix the situation. ✉ International orders generally take around 15 business days for delivery - but can take longer. Customs may take some time to process orders; their turnaround is completely at their discretion. Past orders to international orders have taken around 2 weeks, but that can change depending on customs and things out of our control. ✉ Every order has a tracking number, which is emailed to you once your order has shipped. ✉✉✉ We also offer PRIORITY shipping for USA orders, which will expedite the shipping timeframe, once your order has shipped. Wrapping includes gold kraft paper and bright pink or blue sparkly thick ribbon. I suggest wrapping for items like mugs, and enamel pins etc. Free standard shipping on all orders over $20.00! Hip hip hooray! i love these so hard! can't wait to spread the love! thank you! IF YOU PLACE YOUR ORDERS ON OR BEFORE THESE CUT OFF DATES, ACCORDING TO USPS, THEY SHOULD ARRIVE IN TIME BEFORE THE HOLIDAY. Please don't get your cards wet! They are inkjet printed, which means the ink may run if wet. The same goes for any poster prints. I use a high quality photograph inkjet printer - it prints amazing, but the ink will still run when wet. Mugs should be hand-washed and are microwave safe. WOOT! I do my best to make things as easy as possible for you, however I do ask that you ensure correct shipping addresses. We ship to the address provided at the time of your order. I am more than happy to change a shipping address for you, if it's incorrect and I've not shipped it out. However if the address is incorrect and your order is returned - you will be responsible for additional shipping costs. If you do not respond- you'll be refunded for the product, minus all shipping costs charged by USPS. If your order had free shipping and is returned due to incorrect address, you will be responsible for additional shipping charges. you prefer a refund, you'll be refunded product cost, minus incurred shipping fees, due to incorrect address. Orders ship on business days - which are Monday through Friday. Saturday and Sunday are the weekend and my days to actually rest and replenish. If there is any issue with USPS delivering a package, you need to notify us IMMEDIATELY! USPS can only track a package so long, so if you contact us a month after it was delivered, USPS may not be able to investigate any problems. We want to help you, but we are constrained within timeframes USPS uses. Please let us know of any problems within 15 days. THANK YOU! PLEASE KEEP IN MIND THAT IF YOU ORDER THROUGH ETSY - WE CANNOT SEND YOU MARKETING INFORMATION IN ANY WAY SHAPE OR FORM, UNLESS YOU OPT IN TO RECEIVE EMAILS THROUGH OUR DIRECT WEBSITE. WE ONLY CONTACT YOU THROUGH PERSONAL EMAIL IF WE ARE UNABLE TO RECEIVE A RESPONSE THROUGH ETSY CONVERSATIONS. THE ONLY APIS USED ON ETSY, ARE FOR ETSY RESEARCH ONLY. PROGRAMS USED ARE MARMALEAD, VELA, QUICKBOOKS AND ETSY RANK. THEY MUST ADHERE TO SECURITY MEASURES TO PROTECT THEIR OWN DATA, SET BY ETSY INC.